I’ve been experimenting around with something that might shock you – OneNote from Microsoft. You might think that’s crazy, but hey, it’s free, it runs on all of my iOS and Mac devices, so why not give it a try and see if it solves some problems, right? If you love Evernote and every time you open it you feel happy and it thinks just the way you think, then you should probably tune out and go read or listen to something else. I like Evernote, but I’m never entirely comfortable in there. It seems to be a bit hinky at all times – formatting is weird, finding things seems harder than it should be with all the tagging and such, and I just don’t reach for it as often as the true believers do. I don’t dislike it but I don’t love it. OneNote has SO many fans on the PC side, I figured there must be something awesome about it so I decided to give it a try. When Don McAllister did a screencast on it over on ScreenCastsOnline, I got even more excited. Let’s dig in and see how OneNote works. 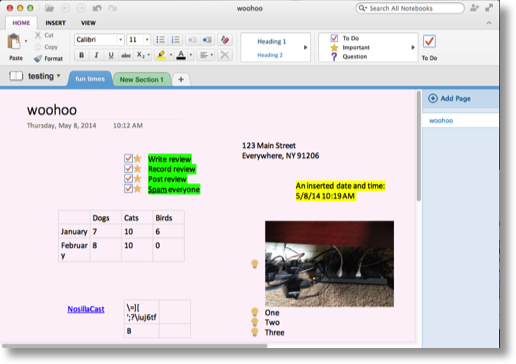 OneNote’s value is increased dramatically by having a Live account by Microsoft. Your Live account will allow your notes to be synced across all of your devices, and since they give away gobs of free storage, there’s not much downside to giving in and registering a free account with Microsoft. Unless you hate the whole idea of any kind of cloud syncing (Dorothy) in which case you’d hate this idea. OneNote has a very familiar look with the now ubiquitous ribbon interface, but it’s somehow much cleaner and simpler looking than the Office ribbon. When you launch OneNote, you’re given your first notebook, which I think is called your email address, at least that’s what it did for me. Unfortunately OneNote on the Mac and iOS does not let you rename notebooks, so this one is super dumb. I’d create separate notebooks right away – like one for home and one for work at least to separate the ideas in some reasonable way. You also can’t move notes from notebook to notebook without copying and pasting. One of the awesome features of OneNote is that you can actually share an entire notebook with someone. That’s cool, but you notice I said “entire notebook”? You can’t share just one section, it’s all or nothing. So let’s say you create a home notebook, and want to share the section on your kitchen remodel, you’ll also be sharing the section on your doctor visit about that weird rash on your foot. It’s dumb you can’t share a section but if you keep that restriction in mind when creating your notebooks you should be ok.
For each notebook, you can create sections which are pretty tabs right under the ribbon. Those you can rename and slide around to reorder to your heart’s content. On the right sidebar within a section tab, you can add pages. This Notebook/Section/Page metaphor works really well for me and makes a lot of sense. I like it a lot better than the loosy goosy tag everything concept over in Evernote. That still feels like anarchy to me! Now we’ve got a notebook and we’ve got some sections and we have a starting page. OneNote is very unusual in that you’re not just stuck in some single page text field, when you click on the page and start typing you’re actually in a text box that you can move around. You can drop in images and slide them away as well. I’m still getting used to the idea of not being restricted on where I can type, but I think it might be a nice freedom. A little bit of anarchy can be good. You can insert tables into your notes which is pretty useful actually. They’re not spreadsheet tables so don’t expect to do any math but a lot of times you just want to make information a little more structured and a table can be a good way to do it. When you select to insert a table you get a grid so you can drag to how many rows/columns you want. Once the table is inserted, you have super obvious icons that allow you to insert and delete rows and columns. It works very well. You can also insert dates and times which I guess could be useful. I really like they way they implemented links – just select any text, and click the Insert link button and very clearly you can see what will be displayed an the link it will follow. Nice and clean. A lot of effort went into making OneNote look pretty and while more functionality is usually what I go for, they really did make this application pleasing to look at. Back to Evernote, it’s sort of harsh to me and the icons are harder to understand because they’re so small. The real test was when I opened up OneNote on my iPad. It’s gorgeous. They really did a good job of making clear icons that are easy targets for fat fingers. At first I was really confused how the syncing worked because I only had the one notebook that my account started with, allison@podfeet.com’s Notebook. I Tapped sync all and it showed that it had synced, but all of the other notebooks I’d created on my Mac weren’t there. I noticed an icon on the left that said “Open” and when I tapped on that it showed Connected Services, including my OneDrive storage area. OneDrive is like Dropbox only with more storage and some more interesting applications. Once I tapped on my OneDrive storage, I could see all of the notebooks I’d created. I think this is actually a good thing because you don’t have to clog up your portable device with notebooks you don’t need to view, but you can get access to them when you need them. I opened a notebook on the iPad, changed something and then tapped the very obvious sync button and in a few seconds the notebook on my Mac automatically changed. Great. Unfortunately there’s a big fall down of OneNote for iPad – unless I’m just being a moron, I can’t figure out how to move things around on the page using my finger. As soon as I tap on a text box, the keyboard comes up and I can mess with the text, but I can’t grab the box to drag it around or resize it. I also tried inserting a table, and it made it exactly 2×2 cells with no options to add or delete rows or columns. So…pretty much useless. Unfortunately while they made the interface beautiful and intuitive on the iPad, it’s more of a consumption application or at best where you could modify things you’ve already written on the desktop. Want even more access to your notes? You can actually log into OneNote.com and use OneNote via the web. It seems to function as you’d hope. In fact, remember how I said on the iOS version you couldn’t move things around? Turns out if you navigate to onenote.com on the iPad, you CAN move things around, edit tables, have all kinds of fun. The app is MUCH prettier so if it meets your needs, its a better experience but if you find something you just can’t do, it’s good to know that you can resort to the web interface if you need to. Chris Ashley of the SMR Podcast shared a notebook with me that has their shownotes and it worked flawlessly. I had written my notes in One Note, so I did have to copy/paste to their notebook but it was very easy. We didn’t do any real time collaboration so it wasn’t like editing a Google Doc but it worked perfectly for our needs. Now the real question will be whether I’ll start using OneNote more and more and slow down on Evernote. I can’t say for sure, the Evernote integration with Clarify will definitely keep one of my feet in that camp but I wouldn’t be surprised if I use OneNote for a lot more stuff in the future. I have a plan to trick Dorothy and Pat into using it for our class notes for an iOS programming course we’re taking! 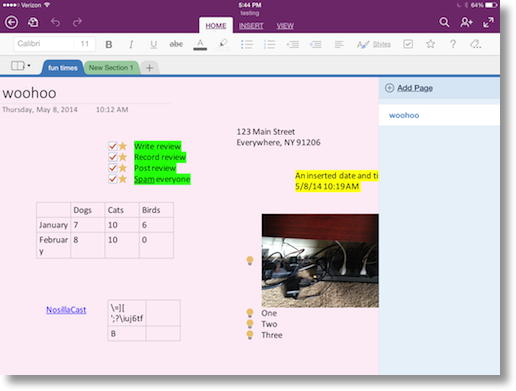 In OneNote for iPad, to move text with your finger. long press. The keyboard will pop up but so will some options including select and select all, and you can drag the handles around to select text as you would expect on an iOS app, you can then cut or copy. My answer to the question is… No, (at this point), OneNote can not replace Evernote. I have a lot of other reasons, but I thought this was the best one for now. Ken – Deleting and recreating isn’t a good solution to rename! But I liked the idea of finding the files, but my notebook names don’t show up in my Finder anywhere. I only see one called Notebook1.url which isn’t the name of any of my Notebooks. Bob – I’m not trying to select the text, I’m trying to move the text box itself around, or an image around like you can on the Mac version. More like doing a layout. Paul – interesting problem to be solved. I wonder what it means by an embedded file? it must make it an attachment in Evernote, not actually importing the data into the note. Good luck with the blood pressure – it’s awfully cool that you have these tools today to do this. As we get more and more real time results we can fix problems before they turn into crises. Jim – I worked for people who enjoyed my honesty, and some who didn’t. Either way I didn’t stop saying what I really thought! Allison, if you open OneDrive you can rename the files. Try this on your iPad. Open OneDrive navigate to the OneNote folder, click top right to select files. Select the file you want to rename and then click bottom right to rename! Took me forever to figure out how to rename notebooks (even with the above directions), so here it is from a Mac: Go to your OneDrive; on the list of notebooks, find the one you want to rename and click on the ellipses in the edit column; in the pop up window, hit the ellipses again; select “edit properties” and then you can rename. I guess the answer to these problems is usually in the ellipses! I didn’t have the regular OneDrive Mac application, so I couldn’t find my binder folder to rename it on my computer. But it’s fairly easy to log in to your OneDrive online and rename it that way. It’s probably a hassle that we shouldn’t have to deal with. But I love OneNote more than any of its competitors — it made it super easy to write my MA thesis, when even dedicated programs weren’t as helpful.